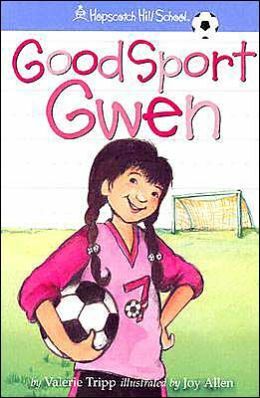 Better With A Book: If you like the American Girl Doll Book Series, Try These!! If you like the American Girl Doll Book Series, Try These!! Do you have a young reader at home who just loves the American Girl Doll collection? I sure do! We have read many of the accompaning stories and have loved them. However, my little one is not quite ready to read the stories on her own. A few weeks ago, I came across a series of books written by Valerie Tripp, an author to many of the American Girl books, and haven't stopped reading them!! Check out the Hopscotch Hill School Series! 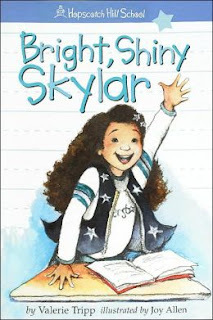 The books read much like the American Girl stories, but the level is right around a second grade reading level, perfect for those young readers who are just learning to read independently. The stories center around a bunch of students who attend the Hopscotch school with their teacher, Miss Sparks. 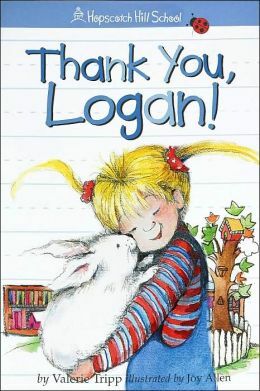 Like the American Girl Doll series, each book ends with some type of positive message about learning, friendship or thoughtfulness. 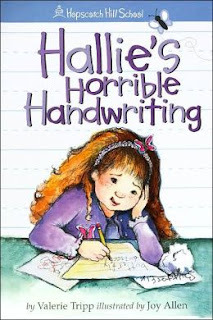 Right now, we are reading Hallie's Horrible Handwriting. Hallie seems to be having trouble with her handwriting and is getting very frustrated! Some friends in the class leave her some special treats to help her with her handwriting and her very special note to some important classroom guests turns out beautifully. What I absolutely love about each of these books by Valerie Tripp, is the section at the end of each of the books that explains a bunch of activities created by teachers and child specialists to help your children with skills, confidence and encouragement. In this book, there are a bunch of handwriting activities, including writing with flashlights in the dark and adding sound effects while writing at home. LOVE, LOVE, LOVE! These books don't seem to be in print at this time, but are still available used on amazon.com. We own one of the books, but have borrowed the rest of them from our school library. They're out there! Apparently, there were even dolls to go along with each of the books! There are several in the series! Check them out! Awesome, thanks! Will definitely check them out! My daughter loved American Girl stuff growing up. I'll have to check these out, just for fun. They sound wonderful and I love the covers. Thanks so much for sharing these books. I hope all is well! Have a great weekend. My little ones are tearing through these books! So glad we found them! My niece is into the American Girl stuff. I am going to pass this on. Thanks! Thanks for stopping by! You may have to search for some of these titles, but it's worth it! !